در شرایط جریان‌گذرا رفتار خطوط انتقال آب بر اساس مشخصات آنها تغییر می‌یابد. در پژوهش حاضر فشار با یک فشارسنج حساس و سریع در خطوط انتقال آب بوکان و پیرانشهر اندازه‌گیری شد. شبیه‌سازی با استفاده از نرم‌افزار بنتلی‌همر انجام پذیرفت. افت اصطکاک با روش‌های مختلف محاسبه شد. نتایج نشان داد که روش ناپایدار ویتکوفسکی در مقایسه با سایر روش‌ها، حداقل خطا را دارد. افزایش سرعت موج، بر فشارهای حداکثر، اثر مستقیم و بر فشارهای حداقل، اثر معکوس داشت. در خط انتقال کوتاه‌تر، کاهش سرعت موج بر فشار حداکثر، اثر مستقیم و بر فشار حداقل اثر معکوس داشت. خط انتقال طولانی احتمال تخریب بیشتری داشت و حداقل و حداکثر فشار در پریود اول به وقوع پیوست. خط انتقال با طول کمتر دارای نوسانات فشار سریع‌تری بود و حداقل فشار در پریود اول رخ نداد. 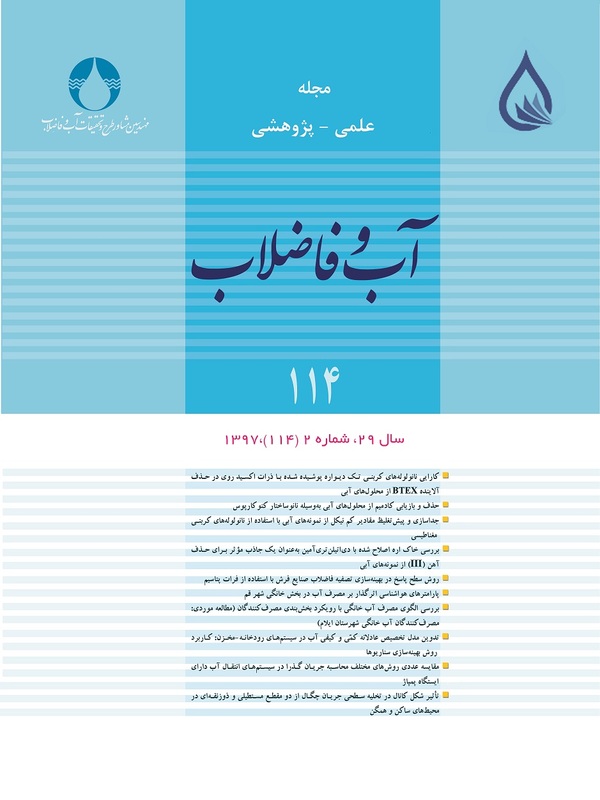 تطابق از نظر پریود زمانی در زمان‌های ابتدایی وجود داشت و در خط انتقال با طول زیاد تا انتهای داده‌برداری حفظ شد. با گذر زمان این تطابق در خط انتقال کوتاه‌تر حذف شد. Under transient flow condition, the behavior of water conveyance system varies according to their characteristics. In the present study, the pressure was measured using a fast and sensitive pressure gauge in Bukan and Piranshahr water conveyance system. The pressure simulation was conducted using Bentley Hammer software. The friction head loss was calculated by different methods. The results showed that Unsteady Vitkovsky method had minimum error comparing with other methods. Wave velocity increase had direct effect on maximum pressures while velocity decrease affected minimum pressures. In a shorter water conveyance system, the reduction of wave velocity had direct effect on maximum pressure. Destruction to the long conveyance system was more probable and maximum and minimum pressures occurred during the first period. Shorter conveyance system had more pressure fluctuations and the minimum pressure did not occur in the first period. Coincidence of periods happened at the beginning and continued untill the end of data recording in the longer conveyance system. However, as time passed by, such coincidence did not occure in shorter conveyance system. Chaudhry, M.H., 2014, Applied hydraulic transients, 3rd Ed., Springer, New York, Heidelberg Dordrecht London. Delgado, J.N., Martins, N.M.C. & Covas, D.I.C., 2014, "Uncertainties in hydraulic transient modeling in raising pipe systems: Laboratory case studies", Procedia Engineering, 70, 487-496. Dallali, M., Guidara, M.A., Bouaziz, M.A., Schmitt,C., Haj-Taieb, E. & Azari, Z., 2015, "Accuracy and security analysis of transient flows in relatively long pipelines", Published by Elsevier Ltd. Engineering Failure Analysis.http://dx.doi.org/10.1016/j.engfailanal.2015.03.001. 1350-6307/_ 2015 Elsevier Ltd.
El-Turki, A., 2013, "Modeling of hydraulic transients in closed conduits", MSc Thesis, University of Fort Collins, Colorado, USA. Najmaei, M., 1995, Water Hammer, Tehran, Iran. Nucci, D. & Russo Spena, A., 2015, "On transient liquid flow", Meccanica, DOI 10.1007/s11012-015-0352-4 Springer Science+Business Media Dordrecht. Nault, J. D., Karney, B. W. & Jung, B., 2016, "Algebraic water hammer: Global formulation for simulating transient pipe network hydraulics", World Environmental and Water Resources Congress, American Society of Civil Engineers (ASCE), 19020. Triki, A., 2015, "Water-hammer control in pressurized-pipe flow using an in-line polymeric short-section", Acta Mech, DOI: 10.1007/s00707-015-1493-1. Springer-Verlag Wien.